There are 649 people waiting on trolleys in hospitals across the country today, according to the Irish Nurses and Midwives Organisation. Yesterday, levels reached a new record high of 714. The worst affected is University Hospital Limerick where there are 58 people waiting for a hospital bed. It is followed by Cork University Hospital with 56 people waiting and St Luke's Hospital, Kilkenny, where 40 people are on trolleys. 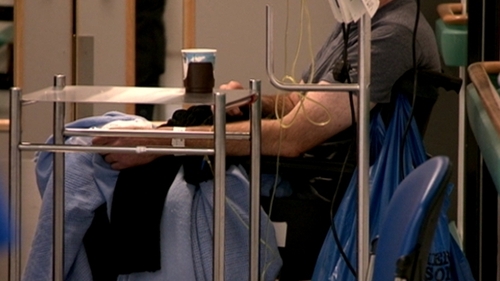 The worst backlog in the capital is at St Vincent's University Hospital where 29 patients are on trolleys. It comes as the HSE's National Director of Emergency Management said that although he hopes there will be some improvement in emergency departments this week, services would remain under pressure with St Patrick's weekend and Easter ahead. Speaking on RTÉ's Morning Ireland, Damien McCallion said a difficult two-week period was anticipated following the severe weather and measures had been put in place to get services back up and running as quickly as possible in the aftermath of Storm Emma. He said services had to be wound down for four days during the bad weather and this was coupled with an 8% increase in attendance at EDs in the first quarter of 2018, 15,000 more patients presenting than this time last year and a record flu period, which he said is finally beginning to decline. He said the decision to cancel elective surgeries was not taken lightly and all non-urgent surgeries were cancelled, while urgent elective surgeries were prioritised. Mr McCallion said people with non-urgent needs should attempt to attend their GP or a minor injury unit. However, he stressed that anyone that needed to go to an emergency department should do so. "If someone has a need for emergency care and a need to go to an emergency department then they should do so, and we need to be very clear on that," said Mr McCallion. "We hope to see some improvement as we go through the week, we do face a difficult week and obviously we go forward in St Patrick's weekend and two four-day weeks, so the system is going to remain under pressure for the coming period." Mr McCallion said the HSE wanted to apologise to people who had been left waiting on trolleys and that it is "not a situation we want to be in". He said that all that can be done is being done and that "all resources are being thrown at this in the short term". Yesterday, Minister for Health Simon Harris said he has allocated an extra €5m to the HSE to ease hospital overcrowding, as levels reached a new record with 714 patients on trolleys or on wards waiting for admission to a bed, according to figures from the Irish Nurses and Midwives Organisation. The money will go towards more home care packages, home help hours and transitional care beds. Mr McCallion said the funding was welcome and would help release bed capacity in 12 hospitals over the next six weeks. Speaking on the same programme, the chair of the National Association of General Practitioners said a 38% reduction in funding for medical card patients was contributing to the current health crisis. Dr Andy Jordan said some patients do not have a GP to attend and are forced to go to hospital. He said Ireland has one of the lowest number of GP per capita in the OECD, with 80 GPs per 100,000 people, as compared to international norms of 120. "When the GP has shut up his premises and no longer exists in a village, well then the patient doesn't have too many options," he said. "What we have done in this country is we have taken the resources out of general practice. We need to put proper systems in place. We have one of the lowest numbers of GPs per capita in the OECD. "In terms of primary care and general practice, we have just made a total mess of it." Later, speaking on RTÉ's Today with Sean O'Rourke, Fianna Fáil health spokesperson Billy Kelleher said his party believed there was capacity in the State to fund the opening of additional beds. Mr Kelleher said the situation is jeopardising health, puts huge pressure on frontline staff and is costing lives.